I finally finished Little House Neighbourhood ( English spelling ) for my sister's Christmas gift, however, it was not without it's trials and tribulations! I started stitching this in January 2011 thinking that I would have plenty of time to finish this, I had everything planned and thought it would be an easy task. Now, the pattern is very easy to follow and I had no worries there, however, the time skipped happily by and before I knew it September had come and gone and then I was in the middle of October thinking "Oooooo must finish my sister's cross stitch" but I got busy with other commitments. I sprained my thumb by banging it real hard on the door handle! The bruising soon appeared and it was quite painful but all I kept thinking was Christmas Day approaching fast!!!! Aghhh!!! I struggled through finally putting the last stitch in thinking " wonderful, it is now finished" and suddenly realised I had stitched it in the wrong colour and forgot to alter the chart for the English spelling of neighbourhood! I knew if I left it with the American spelling everyone would think I had spelt it wrong, so it was much easier to change it. I framed it in a Cherry wood frame. My thumb is much better but it is still quite sore, but at least I got it finished, and, by the way, my sister Ann- Marie loved it! I framed The Chocolate Shoppe today. Thankyou for all of your lovely comments on my little red box set in the previous post and welcome to all of my new followers! Have a wonderful New Year, see you in 2012! Christmas box exchange finally arrived at destination and a free pattern for you. I hope you all had a lovely Christmas and are looking forward to the New Year! I was very pleased to finally hear from the moderator of the Hooked On Exchanging blog that my box had finally arrived at it's destination, I was ever so worried that it had got lost in the post as I sent it on the 1st December. I painted a little box and hand made some polymer clay roses and a red brooch to go inside the box with some pretty red ribbon. I lined the box with white fabric and edged the inside with red cording. 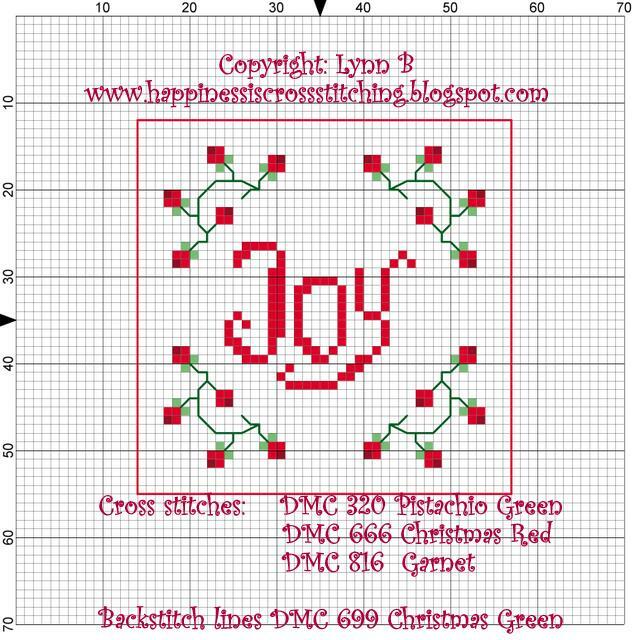 The cross stitch pattern is my own design and is available at the bottom of this post for you to print. I have finished Little House Neighbourhood for my sister's Christmas gift, I shall show pictures in my next post. I am really pleased with the way it turned out, I have framed it in a simple cherry frame and even though I say so myself it really looks lovely. Look what arrived in the post for me! This lovely Christmas cross stitch box arrived from Marie ( blog here ) and I absolutely love it! Marie very kindly sent me the beautiful box that contained chocolates, a Mill Hill beaded cross stitch kit, some lovely Christmas buttons, ribbons and a small cross stitch chart. Thankyou so much Marie for this lovely exchange! The box I sent to my partner has not arrived yet, as soon as it does I will post a picture and a free cross stitch pattern. The trim looks ,like snowballs - how cute! I am looking forward to making something with these cute buttons. This is the beaded kit that was included. This is just a quick post to let you know what I have been up to! 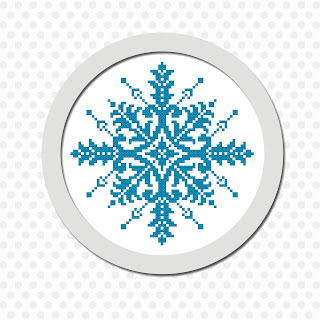 My latest cross stitch patterns are these two tea patterns and the snowflake design, I like these because they are quick stitches and great for a beginner too, I have also designed a larger snowflake pattern that you can see below. I have not much to show at the moment because I have been working on a box for the Hooked on Exchanging Too blog, I sent that last week, therefore I can only reveal the box once my partner has received the gift. I am looking forward to showing it because I have designed the pattern myself and will be offering it as a freebie in the next post. 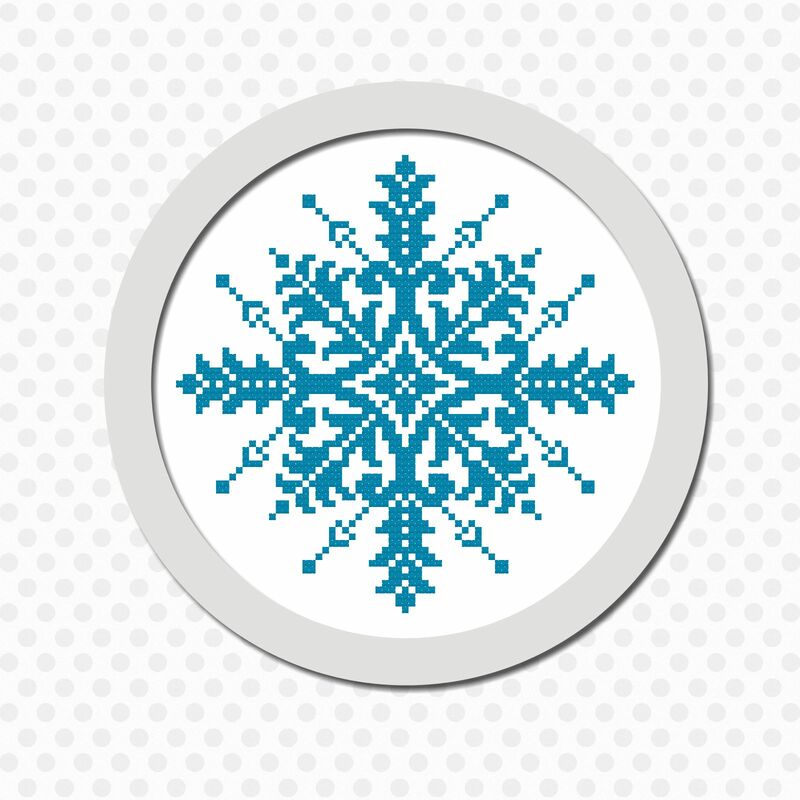 here is the larger snowflake design, email me in my profile if you wish to purchase this. Happy stitching everyone, thankyou for all of the lovely comments and a big welcome to all of my new followers.